Anchored on NIDO FORTIFIED’s “Wear Your Love” Mother’s Day initiative, dads and kids worked together to orchestrate a relaxing and exciting surprise to make the advance celebration of the World’s #1Moms Day extra special last May 3. 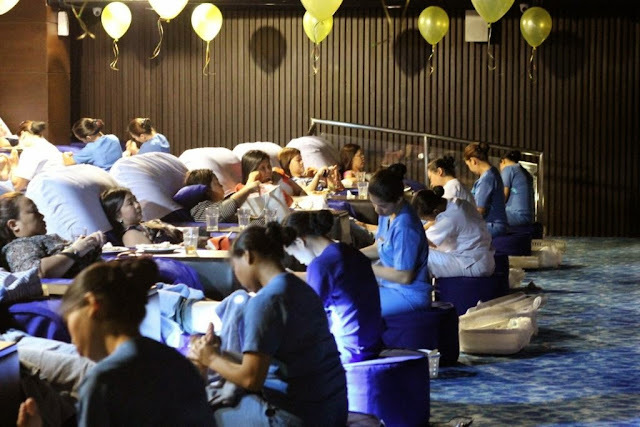 My surprise Mother’s Day treat, along with the other mommy blogger invitees, started with an early lunch at Blue Water Day Spa Ortigas branch courtesy of NIDO. The kids were taken cared of so that mommies can enjoy their pampering treats---a foot massage with reflexology coupled with a back massage. I really need one and so I was grateful that they made arrangements for the kids. I watched "Friends with Kids" in their spa theater without interruption, amazing right? As the pampering came to an end, I asked where my daughter was. I was told that the kids are in another place and we moms have to wear blindfolds on our way there. Though baffled, I decided to go along with it. My sudden feeling of wonder came with excitement just thinking about what awaits us at the next venue. After a few minutes, we alighted the shuttle and then we were told to remove our blindfolds at count of 3. I was standing infront of my child, who was holding a yellow rose for me! 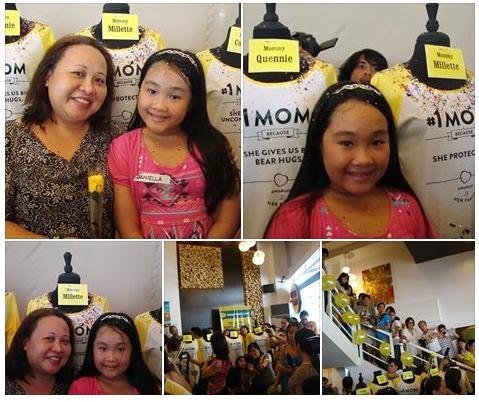 Kids and even husbands of mommy bloggers filled Uncle Cheffy's Greenhills Promenade branch. Everyone there greeted us with a Happy Mother's Day. There was a confetti shower as our kids handed out the roses! Best of all, #1 Moms got customized shirts which is part of NIDO FORTIFIED “Wear Your Love” Mother’s Day initiative. The said shirts will be placed in NIDO FORTIFIED-inspired cans and will be delivered to moms as surprise packages during Mother’s Day week. A hefty feast was served to cap off this creative tribute to moms. The NIDO FORTIFIED “Wear Your Love” Mother’s Day initiative successfully encouraged thousands of kids to declare their heart-warming messages for their mothers through customized shirts. Kids answered the question “What makes your mom #1?” at www.nido-fortified.ph with the help of dads and other family members. The 2000 entries were immortalized in NIDO #1Mom shirts that were delivered to intended moms this Mother's Day week. Thank you to NIDO FORTIFIED for making me feel so much loved!